Images on this page are of early Internet age and will be replaced with better ones in the near future. The latter was daily service in 1931 and by August of that year he had reached out to Cucuta but it is not known exactly when he started nor whether the extension, too, was daily. 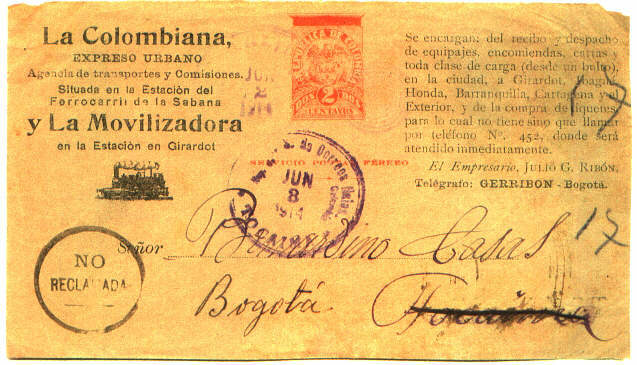 At first letters on the Cali - Bogota run were carried by air but this infringed SCADTAs monopoly so that had to be abandoned after very few letters have been flown and the service continued by motor bus. The firm apparently started out as Julio G. Ribon & Hijos (I.E. 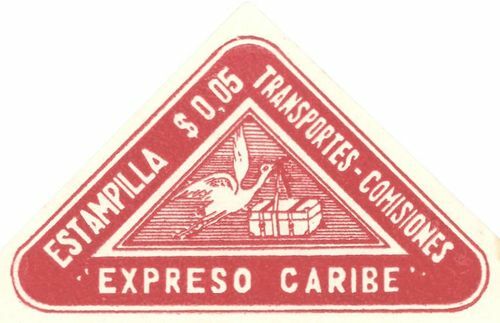 & Sons) and apparently principally as baggage agents, in which field they were later quite prominent but soon took the title of Expreso Colombiano del Pacifico" with the family name appended. * This Del Pacifico" always struck me as being somewhat curios since, so far as I know, they never extended their activities nearer the Pacific Ocean then Cali; in fact, Cali and Bogota are the only two place names on that map which has to become the standard type of adhesives. Another proof" is that Express Coys (usually Tobon) even when past over to Ribon for on-carriage to Bogota. This "receipt" is dated June 8, 1914, long time before Ribon has issued their first stamps. Any information regarding the receipt would be highly appreciated. Perhaps, some such thoughts occurred to Ribon for soon Del Pacifico" was dropped from the title although for a long time afterwards the two names seem to have been used indiscriminately. These names incorporated in handstamps were used as (dated) cachets where no adhesives were used and as cancellors of adhesives when those where affixed. 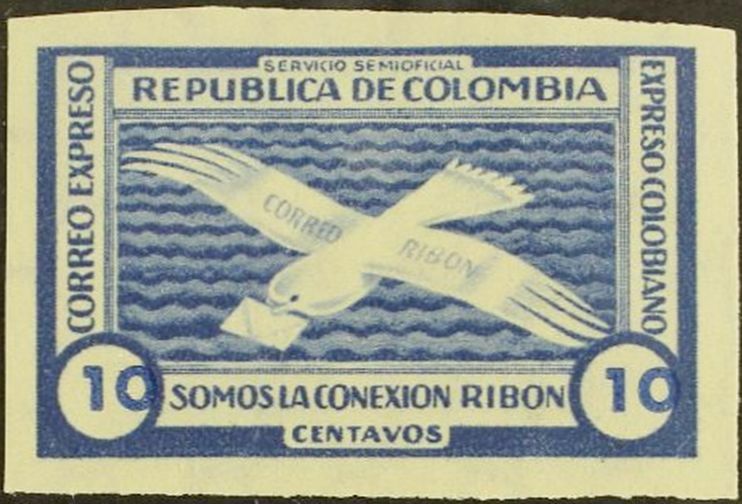 Later these oval ovals were replaced by a variety of double-lined circles of which Conducto Ribon" was the main feature; the date was included in the middle but at the bottom was Correo Diario" Correos - (placename)" or Correos-(placename). There as one exception (know to me) to the oval type and this was too gave prominent to the family name. I have only seen one example and that was for APULO. A total of six different issues are know. The 4th. issue (1931?, 1929?) you can view below, finally as a complete set of all six values... (Temprano No. 6-11). 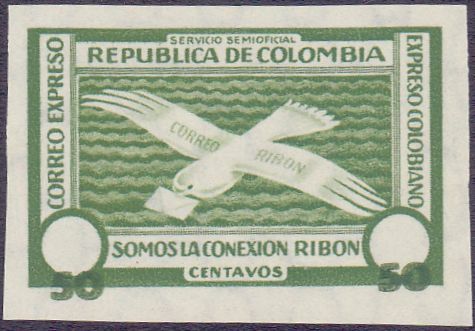 The 6 Centavos stamp of the 4th. issue I have, overprinted with "Propaganda". So far nobody could give ma any information regarding that overprint. For your information, the stamp is shown below. Any information about that overprint is highly appreciated. The 5th. issue was a provisional issue since the postage rates apparently have been increased. The set contains 4 stamps, only three are shown so far.., the other value from this set is the 5 centavos on 30 centavos. These stamps have been created by overprinting the stamps of the 4th. issue as shown above. Hurt puts the first at 1928 but even this particular stamp or rather Hurt #2) is held by a Hamburg collector clearly cancelled August 6. 1927. The point is, though, that Hurt #1-2 were preceded by at least two other sets which were included on cover among 150 Express Company covers offered as a collection by Jal Franks Ltd. in April 1966. In this second issue Hurt #3 is badly out of place since all the rest are multiples of 6c. - naturally, one would expect a definitive 5c. to follow a provisional 5c - but the date for Hurt #4-8 is much too late. 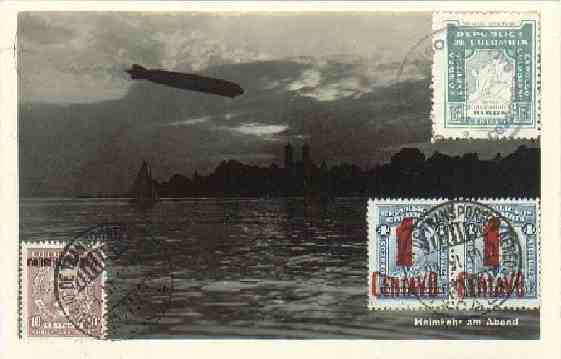 Stamps with a clear postmark of 1928 and 1929 exists. 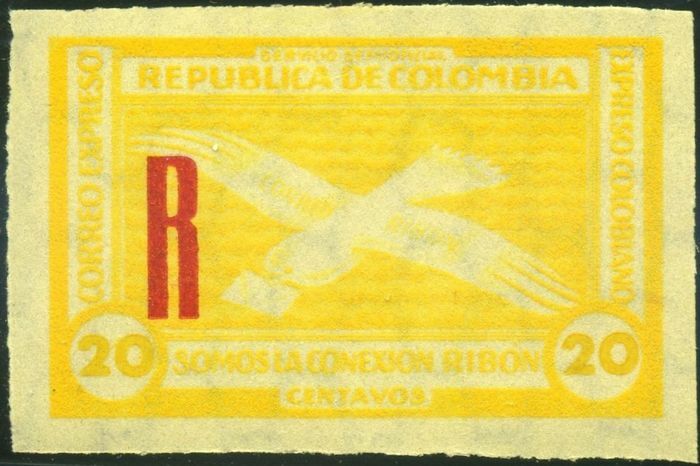 The (Hurts) second set 80 were printed by the Government printing works Bogota. Just discovered, three apparent proofs of the 10 centavos, 50 centavos and 20 centavos denomination registration stamp. Any information on that item and eventual other nominations that exist are appreciated.